An estimated 33 million users deserted Microsoft's browsers last month, pushing the Redmond, Wash. company's browser strategy ever closer to the edge of irrelevancy, according to analytics data published today. Internet Explorer (IE) and Edge combined to account for 36.7% of the global user share -- a stand-in for the number of desktop and notebook PC owners who ran those browsers -- in June, according to U.S.-based metrics vendor Net Applications. June's IE number was down 1.9 percentage points from May, the eighteenth straight month of losses. In the last 12 months alone, IE -- a bucket into which Computerworld also pours Windows 10's Edge -- has lost 17.3 percentage points, representing a loss of almost a third of what the browser controlled a year ago. Chrome continued to rake in former IE users, as Google's browser added 3 percentage points to its share last month, closing out June with 48.7%. 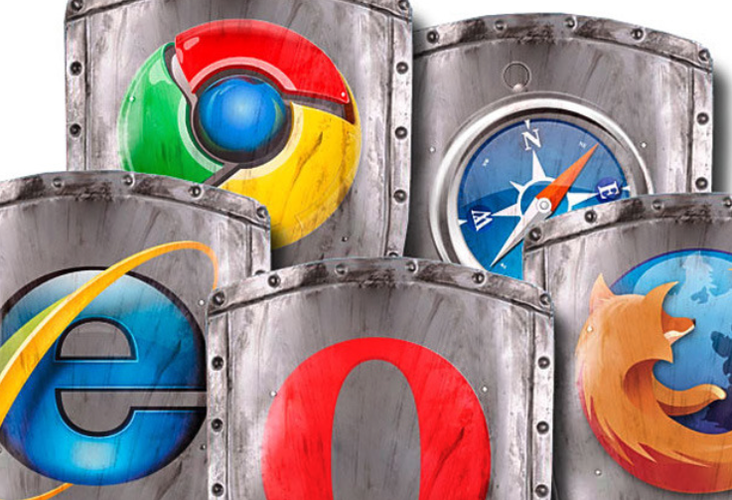 Chrome took bragging rights as the most popular browser in April when it slipped past IE for the first time. Chrome's rate of increase has been astounding, doubling its user share in just over 12 months. If Chrome continues on the blistering growth rate of the past year, it will reach the 50% mark this month. Like IE, Mozilla's Firefox also lost user share in June, falling another nine-tenths of a percentage point to 8%. Unless Mozilla can arrest the flight, its desktop browser could drop under the 5% mark as early as October, threatening the organization's long-term survival, which relies on search revenue from the likes of Yahoo to pay the bills. Other top browsers, Apple's Safari and Opera Software's Opera, remained flat and showed a small gain, respectively. But the big browser story remained the shocking shrinkage of IE. In June, 41% of all Windows users ran a Microsoft browser, a figure that was down from 43% the month before. The difference between May and June: A decline of 33 million when calculated using Microsoft's oft-expressed claim that 1.5 billion PCs run Windows worldwide. 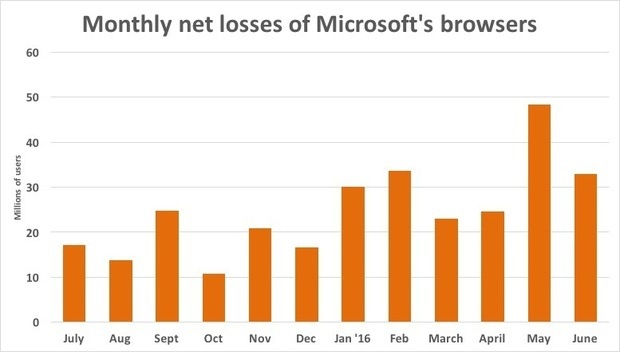 The only consolation for Microsoft was that June's losses were less than May's, when an estimated 48 million users ditched IE. During the last 12 months, almost 300 million users dumped IE. But the majority of those losses -- just over two-thirds -- have taken place since January. It was no coincidence that IE's losses accelerated in 2016: That was when a Microsoft mandate kicked in. Faced with Microsoft's demand to upgrade to the newest edition of IE, people instead rethought their choice of browsers. Desertions from Microsoft's browsers accelerated in 2016 as the company's upgrade requirement went into effect.